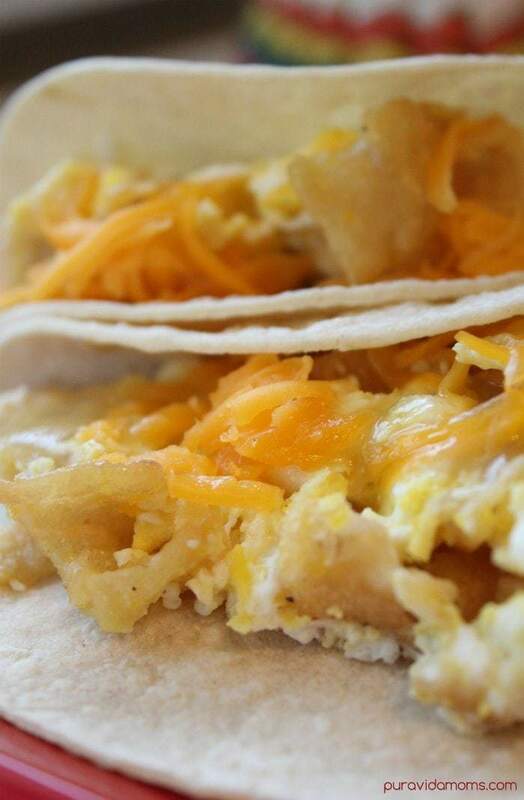 Haven’t experienced a Migas Taco for yourself yet? Our Torchy’s Copycat recipe is sure to be a new household staple! I love Torchy’s Tacos. Let’s just make that clear. Since they have arrived in Denver, I have spent more than my fair share of time trying their menu. While I love love LOVE their queso dip as an appetizer, I will say that my favorite taco of all time is the Migas Taco. While the Migas is probably considered a breakfast taco (you know eggs) I find myself craving it at all times of the day. 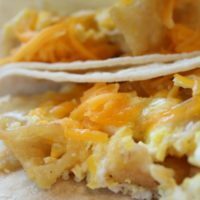 What I absolutely love about this taco is the tiny fried tortilla strips that are mixed in with the eggs- it’s the perfect mixture of crunch, saltiness and spice. Plus, I pretty much always have all of these ingredients on hand, which makes for a perfect last minute “Brinner” (You know, breakfast at dinner?) 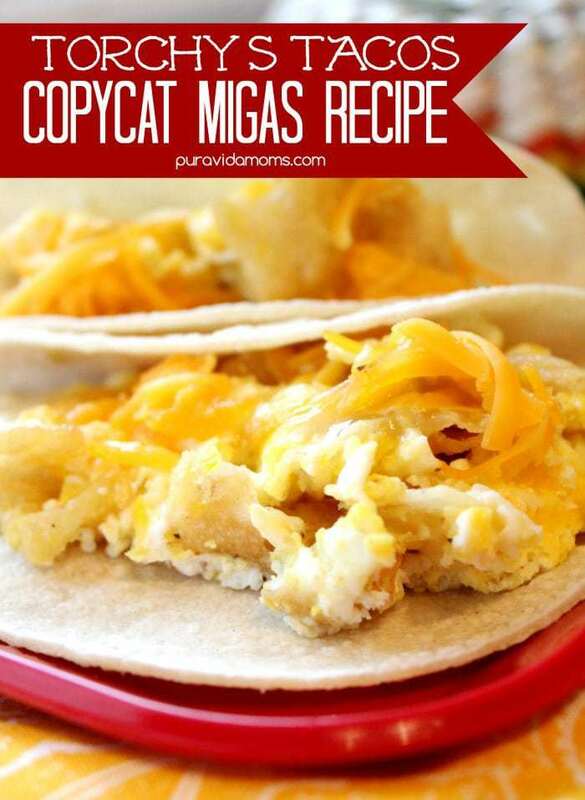 Here’s the Migas Tacos Recipe. Please note that this post contains affiliate links that support Pura Vida Moms at no extra cost to you. This meatless breakfast taco recipe is fast, delicious and easy- perfect for a family dinner or breakfast on the go. For the fried tortillas: Take 1-2 corn tortillas and slice them into small strips. I usually cut the tortilla in half, and then into about 8 horizontal slices across. Using about 1/2 cup oil, fry the strips until just golden. Note- I often use old tortillas for this, and batch fry lots. I then store them in the fridge in a canning jar so they are ready when I am craving the Migas Tacos. Put the enchilada sauce in a saucepan on medium low. This will heat the sauce to just above room temperature so that it’s nice and warm when you add it to the top of your taco. For the eggs- Scramble 6 eggs. I add salt and pepper to the eggs at this point because I think it tastes more like Torchy’s. When the eggs are about halfway done, add about 1/3 cup of the fried tortillas and finish cooking as normal. If you are using the diced green chiles, add them at the same time as the tortillas. I heat 6 tortillas for the tacos at this time. You can do this on the stovetop by heating up a pan to high and placing the tortilla on the pan for about 10seconds a side, or until warm. You can also buy a handy dandy tortilla warmer for the microwave (I LOVE THIS THING– affiliate link) and heat your tortillas that way as well. Now it’s time to plate the tacos and eat. On each tortilla add about 1/6 of the scrambled eggs, a dollop of enchilada sauce, and a sprinkle of cheddar cheese. Serve and eat! Delicious- absolutely perfect combination of spice, crunch and of course cheese. Sometimes, I even add a bit of our creamy green salsa on top too. And, when I eat these Migas for dinner, a Skinny Paloma Margarita is sooo delicious. Looking for more Latin recipes from Pura Vida Moms? Put the enchilada sauce in a saucepan on medium low. This will heat the sauce to just above room temperature so that it's nice and warm when you add it to the top of your taco. For the eggs- Scramble 6 eggs. I add salt and pepper to the eggs at this point because I think it tastes more like Torchy's. When the eggs are about halfway done, add about 1/3 cup of the fried tortillas and finish cooking as normal. If you are using the diced green chiles, add them at the same time as the tortillas. I heat 6 tortillas for the tacos at this time. You can do this on the stovetop by heating up a pan to high and placing the tortilla on the pan for about 10seconds a side, or until warm. You can also buy a handy dandy tortilla warmer for the microwave (I LOVE THIS THING- affiliate link) and heat your tortillas that way as well. Now it's time to plate the tacos and eat. On each tortilla add about 1/6 of the scrambled eggs, a dollop of enchilada sauce, and a sprinkle of cheddar cheese. Serve and eat!